The first bite comes, and it's pure deliciousness. Flour mingles with sugar, which has already combined with baking soda and white chocolate. The tantalizing taste of the cookie lingers on the tongue, as it leaves, only one thought can remain. More. More. More. Bite number two follows. The mouth region prepares for more amazingness. And it gets it! But what's this? Suddenly, there's a brick of inedibleness in this culinary delight. Hoping someone accidentally dropped poison in the batter, the chews continue. Soon the invader is found out, and it's far more terrifying than run of the mill anthrax or cyanide. Some fool has ruined pastry forever by bringing nuts into the equation. Macadamia nuts at that. Rather than risk death from more nut cookie consumption, the cookie is quickly incinerated with a pile of napalm and torched to high heaven. Hopefully this wanton act of destruction prevents anyone else from falling for the siren sound of cookie only to get harpooned by the awfulness that is nuts. It's amazing how frightfully common this scene occurs. I speculate it occurs roughly 17 times a day—but I'm probably undershooting. And while it's a great boon for the much maligned napalm industry, it's a travesty for connoisseurs of fine baked goods worldwide. Just imagine being told you're about to do something insanely great and fun like going to an amusement park, only to realize that amusement parks are an incredible waste of time and money and are pretty boring to boot. In a nutshell, that's what happens when you combine nuts into pastry. Keep in mind, I'm not some rabble rouser who aims to take the nut industry down—I'll leave that to the allergics and the hypochondriacs. No, I'm against putting nuts in baked goods, because it makes them taste awful, which is the pure antithesis of what cookies, scones, cookie dough, cakes, frosting covered cookie dough, cookie dough ice cream, nachos, cookie dough batter, doughnuts and cookie dough should be. To prove my point, I now present to you two case studies that I definitely didn't just make up just to prove my point. 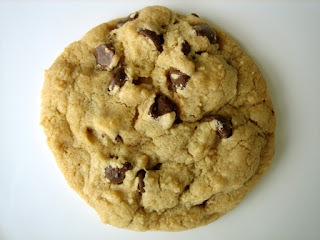 The monster cookie basically combines all that is good with the world into an amazing morsel of deliciousness. I'll even allow it to have peanut butter, because the crushing process actually allows the cookie to have decent taste. While the name might seem scary, the taste definitely isn't. Now contrast this with another case study... a very different one. Case Study B: Horrible piece of crap cookies that waste a bunch of good and tasty ingredients by including crap like macadamia nuts or pistachios or cashews or peas or walnuts or some other waste of calories, thereby turning goodness into a high concentration of awfulness which is purely inedible and nobody actually likes, due to the sheer crap-tastic nature of nuts in baked goods. While the wining description of this product sounds “delectable,” you actually cannot check up on this cookie. Go ahead, just check out any bakery. You see those delicious-looking cookies? They have no nuts in them. You see that pile of nuts with a bunch of flies buzzing around them letting out the fly equivalent of profanity? Those are the remnants of nut cookies. Please note how even flies, who tend to eat vomit and excrement, avoid the awfulness that is nuts in baked goods. These case studies are certainly damning, but the thing is, I actually don't dislike the concept of nuts. If there's a bowl of cashews, I'll definitely dig in. But when it saps the good out of otherwise delicious items, I get angry. I don't buy into this “Salty Sweet” philosophy, when we could easily push forth the concept of “Sweet Sweet,” and please the masses. If you put crap into good, it brings down the whole equation. Here's a final bit of food for thought (pun intended)—one of the most popular cookies in the world, Chips Ahoy, is called “Chips Ahoy,” not “Nuts Ahoy.” You just ponder that one!